Although Klingon is by far the best known example of a “sci-fi language”, it is not the only one. Two more recent examples of languages artificially created for sci-fi films include Na’vi, the language of the aliens in the film Avatar, and Dothraki, a language created for HBO’s adaptation of George R.R. Martin’s epic fantasy tale, A Game of Thrones. Both languages were created by professional linguists: Na’vi by Paul Frommer, a professor at the University of Southern California and a linguistics consultant, and Dothraki by a professional language creator David J. Peterson, for whom this is his fourteenth linguistic creation. As was the case for Klingon, the producers of Avatar and of A Game of Thrones wanted a language that is at the same time human-like enough to be manageable for the human actors and yet also alien enough to fit the genre. To achieve that, both Frommer and Peterson turned to linguistic typology for answers. They looked for sounds and structures that are within bounds of what is possible in a human language, but are at the same time fairly exotic in languages of the world. One example of making an artificial language sound exotic by using an exotic linguistic feature is the use of the so-called ejective sounds in Na’vi. These are sounds like /p/, /t/, and /k/ but with a certain “spat out” quality to them. English does not have ejective sounds so it is difficult for an untrained English-speaker to pronounce them. But let’s consider how they are pronounced anyway. To pronounce a “plain”, non-ejective version of, say, /p/ we press the lips together, which prevents the air from escaping the mouth for a short moment, and then release abruptly, which lets the air explode out of the mouth (try it!). To say a non-ejective /t/ we use the same “close-and-release” strategy but instead of pressing the lips together, we press the tip of the tongue at or behind the upper teeth; a non-ejective /k/ is achieved by the same “close-and-release” technique but pressing the back portion of the tongue against the soft palate (that’s the soft part at the back of the roof the mouth). Their ejective counterparts are pronounced in the same fashion, but in addition to creating a closure in the mouth (with the lips, tip or back portion of the tongue), the space between the vocal cords in the larynx (called “glottis”) is closed and released as well. While it sounds exotic enough, we are familiar with this glottal closure in English too: we do it in the middle of oh-uh! It is this additional closure of the glottis that creates the dramatic burst of air that distinguishes an ejective sound from a “plain” one. You can hear some ejective sounds pronounced here. Do they sound exotic enough? As it turns out, quite a few of the world’s languages have such ejective sounds. 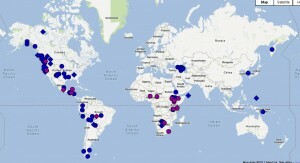 In fact, 92 out of 567 languages in the World Atlas of Linguistic Structures have them (see map below). Perhaps the best known examples of languages with ejective sounds come from the Caucasus region, between the Black and Caspian seas. 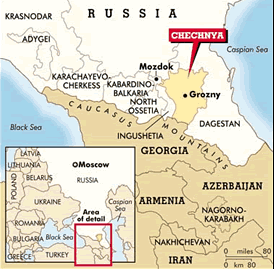 Languages from all four language families indigenous to this region have ejective sounds, including Abkhaz (Northwest Caucasian family), Ingush (Nakh family), Tsez (Northeast Caucasian family), and Georgian (South Caucasian, or Kartvelian, family). 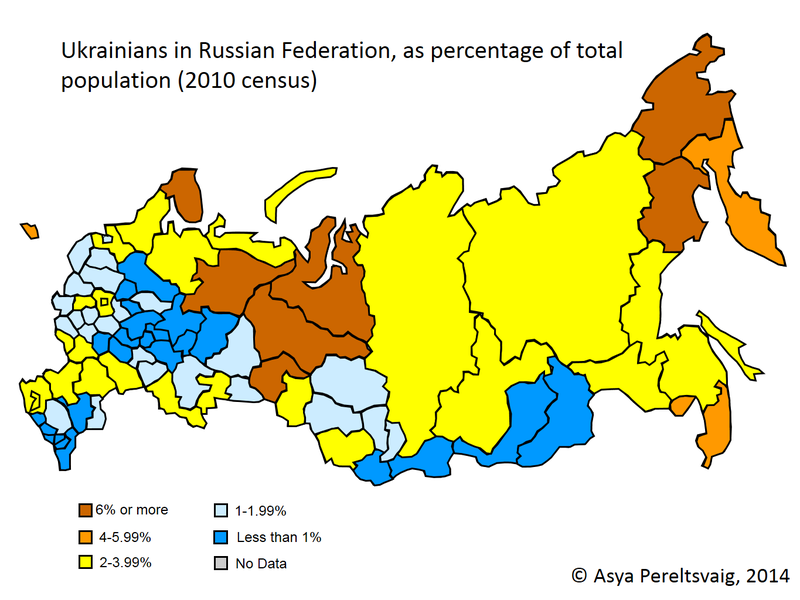 Moreover, ejectives are found even in languages from other language families that are spoken in the region, most notably (some dialects of) Armenian and Ossetian (more on the latter in a later post). Outside the Caucasus region, ejective sounds can be heard in Athabaskan, Siouan and Salishan languages of North America; Quechua and Aymara, spoken in Bolivia; Amharic, one of the major languages of Ethiopia; Hadza and Sandawe, two Khoisan languages spoken in Tanzania; their Khoisan relatives in southern Africa; and Itelmen, an endangered language spoken in Kamchatka. The sound system of the Dothraki language from A Game of Thrones is also rather exotic; however, it is not because of specific sounds that it has, but rather because of the sound that it does not have. Specifically, Dothraki has a 4-vowel system which includes /i/, /e/, /a/ and /o/ sounds, but no /u/ sound. 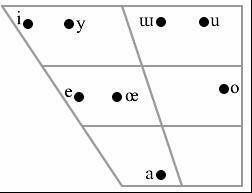 This sort of vowel inventory is very rare for a natural human language. In fact, most of the world’s languages have larger vowel systems, with 5 or more vowels. Thus, World Atlas of Linguistic Structures Online lists 288 languages (52%) as having 5 or 6 vowels and 183 languages (32%) as having 7 or more vowels (English is one of them). Only 93 languages (16%) have as few as 2 to 4 vowels. To pronounce the i-sound, the tongue moves to the top front part of the mouth (shown on the top left in these diagrams); for the u-sound, the tongue is in the top back part of the mouth (shown on the top right); and for the a-sound, the jaw is lowered and the tongue is at the bottom of the mouth (that’s why a doctor asks you to say ah rather than eeh or ouh when he wants a glimpse of your throat!). 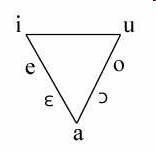 Even English, with its 15-20 vowels (depending on the dialect), includes the basic (long) /i/ (peel), /u/ (pool), and /a/ (father). 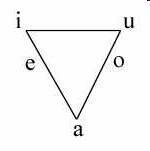 The reason that human languages insist on having /i/, /u/, and /a/ is that these three vowels delineate the three corners of the vowel space: they are pronounced and perceived acoustically as the most distinct. Thus, the Dothraki language lacking the u-sound makes it quite unusual, as far as human languages are concerned. The grammar of Dothraki also underscores another important point: what may seem exotic to speakers on one language (say, English) may not be exotic if a wider range of languages is considered. Take, for example the English phrase the big house. To an English speaker it seems perfectly natural to place the adjective big before the noun house (and *the house big is perceived as a “word salad”). But as it turns out, many – in fact, most – languages of the world go with the opposite order. For example, the same phrase translates into Spanish as la casa grande. Other Romance languages vary as to which order they use and where. For example, in French most adjectives appear after the noun, like in Spanish (e.g. consider the expression “to have a carte blanche”, which English borrowed from French, where it literally translates to ‘card white’). Yet, other adjectives appear before the noun in French: thus, we speak of the Belle Époque, literally the ‘beautiful era’. And yet other adjectives can appear either before or after the noun, but with a different meaning: for example, while Napoleon can be characterized as un grand homme ‘a great man’, he cannot be truthfully called un homme grand ‘a large man’. However, if we consider a bigger sample of human language, as in the WALS data, we quickly realize that the noun-adjective order is far more common than the opposite, adjective-noun order, familiar from English. The former is found not only in Spanish (and to some extent in other Romance languages), but also in Hebrew and Arabic (Semitic), Malagasy and Rapanui (Austronesian), as well as Hixkaryana (spoken in northern Brazil). Altogether 768 languages in the WALS sample feature this word order, whereas the opposite, adjective-noun order is found in only 341 languages (with another 104 language indeterminate in this respect). Thus, English is on the more exotic side in terms of adjective-noun order. And the Dothraki language, the creator of which aimed to make it as exotic as possible, actually exhibits the noun-adjective order, which is exotic to an English ear but not from a wider cross-linguistic perspective.